In remembrance of the events of 9/11, Interim Head of Middle School Chelle Wabrek hosted a Memorial Service today for Middle School students. Wabrek urged students to remember that although they were not yet born at the time of these events, 9/11 is an important day for us all and forces us to consider how to be heroes every day, not just in the face of tragedy. Father Harmuth opened the assembly by giving a brief overview of the events of 9/11. In 2001, Father Harmuth served as a chaplain for the Dallas division of the FBI and was part of the second group sent to Ground Zero in New York City a week after the attacks on September 11. There he served in the morgue and spoke with rescue and recovery workers on the ground at St. Paul’s Episcopal Church. 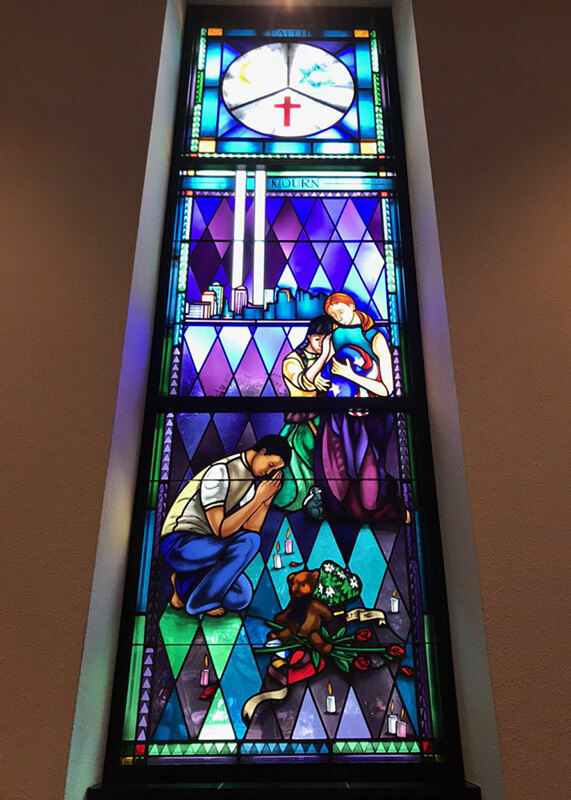 Father Harmuth was also instrumental in the design of The Mourn Window, one of Dallas’ permanent memorials to 9/11, found in ESD's All Saints Chapel. Jody Trumble, Director of Campus Safety, also shared her story of service during the tragic events. Trumble was a member of the Air Force Reserves at the time and had just finished a night shift at the Burleson Police Department when she was woken up to the news. She remembers a friend calling her repeatedly, waking her from just an hour of sleep around 9:00 a.m. She answered, “The world better be on fire.” As she turned on the TV, she realized it was - and was immediately prepared to travel where needed to help out. “Life is about service, and we never know when something may happen to change our world. When you have the chance to act, to be a hero - be one,” she concluded. We are so thankful for the service of Jody Trumble and Father Harmuth, and all those who serve and act as heroes to keep us safe!